URSC were today pleased to present the Crystal Clear Glass Engravers*, sponsored Player of the Months Award for September and October to Paul Marshall. In a close run poll, Paul narrowly defeated Stuart McCloskey in the voting, with Craig Gilroy not far behind in third. 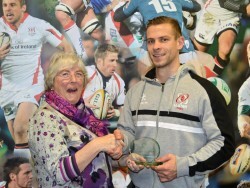 Congratulations to Paul who shared a joke with Committee member Jackie Halleren as she presented his trophy. Congratulations also to Ivan McStea whose name was drawn from those who voted for him. We’ll be in touch with Ivan shortly to arrange handing over his prize. *Thanks also to Crystal Clear Glass Engravers, (37a Lisburn Road, Belfast) for their continued support of these awards.